For any black metal fan, the name Ihsahn should be important considering his influence on the genre through his work with the band Eemperor. 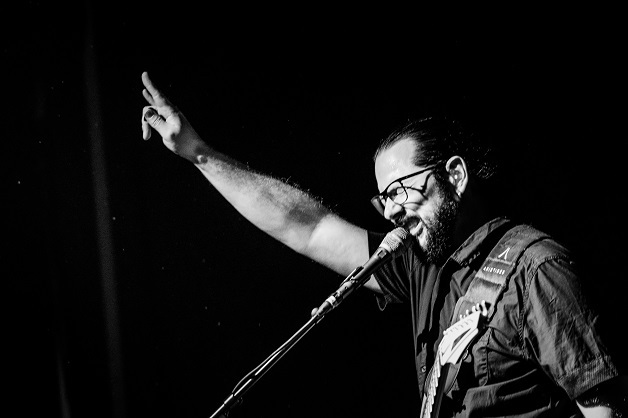 Tonight, however, the focus is on his more progressive solo project simply named Ihsahn. As he remarks from the stage tonight, it is about high time he plays a show across the pond from his home country of Norway. 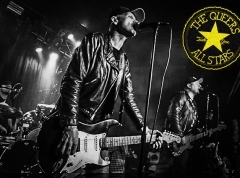 As such, it is somewhat disappointing that Lille Vega is not sold out when a musical metal legend like this comes our way for the first time. The room is fairly filled up, though, and the audience is dedicated and engaged during the headliner’s as well as the main support band’s set, so we’re in a for a solid evening after all with three bands that each provides a different slice of what progressive metal can be. Just like the headliner of this evening, the instrumental progressive metal trio Astrosaur is from Norway. To my knowledge, this is their second time in Copenhagen and like last time, they are playing songs from their 2017 album "Fade In // Space Out". At most times, the songs they weave have clear melodic riffs that provide a good center in the music, like an anchor to hold on to especially in the longer compositions. The fast-paced "Space Mountain" is a case in point and is one of the highlights of the set with its several unhinged solos in addition to the simple but impactful main figure. The songs rise and fall in intensity and in general, the set has a nice flow to it, always leaving us time to breathe in between heavier sections where the onslaught of guitar and bass can become quite intense. We also get a new version of Radiohead's "Pyramid Song" which the three musicians really succeed at making their own as they build up the emotional chords slowly before taking it up a notch and ending in spectacularly hammering fashion. The room is not very crowded as they begin their set, sadly, but as they play on, more and more arrive. The music gets to speak very much for itself, though, which doesn’t exactly draw the greatest enthusiasm out of the gathered crowd and the show ends a bit abruptly. Nevertheless, the sound is nice and heavy and Astrosaur provides us with a fine start to the evening. All the way from Australia, the progressive metallers of Ne Obliviscaris always seem to attract a bunch of very dedicated fans when playing here. 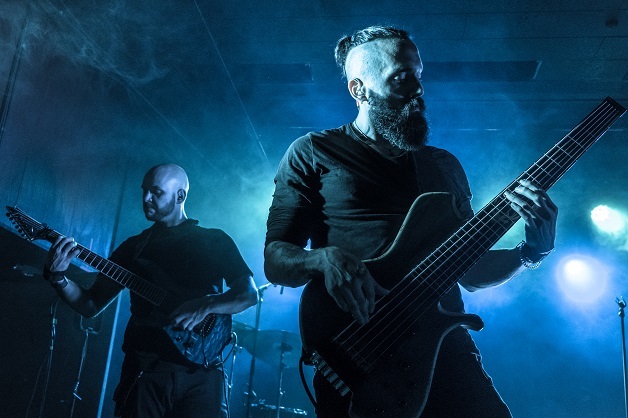 They did visit earlier this year as part of Aarhus' Royal Metal Fest but in Copenhagen, we haven't seen them since they played a small show at Beta two years ago. Luckily, even though there are all of three bands on the bill tonight, they get to play a set lasting almost a full hour. They start out with the older single “Devour Me, Colossus, Pt. 1", immediately showcasing all the elements that make up their complex music. The band has a growler as well as a clean vocalist who also plays the violin and these two are backed by two guitarists, a bassist, and the biggest drum kit of the evening complete with two kick drums and a bunch of various cymbals. As such, there’s plenty going on in the music all the time and the band is also great at engaging their audience, encouraging both fists in the air, clapping, and cheering. The middle part of the set consists of three new songs from their latest album “Urn". Especially “Libera, Pt. 1" stands out here but “Intra Venus" with its Spanish-guitar-like pickings and bass melodies and the cacophonic “Urn, Pt. 2" also impress. Even as the songs vary in intensity and have quieter as well as all-out instrumental insanity sections, this is truly a band that is often firing on all cylinders and to my ears, it gets a bit much towards the end of their set. On the other hand, it also means that we get some pretty impressive moments where their clean vocalist sings and plays the violin at the same time while growls, guitar riffs, and blastbeats hammer on as well. It’s evident that a lot of thought has gone into meticulously planning how everything fits together, but nevertheless, it seems the sound mix can’t quite handle everything that’s going on and the result becomes a slightly tiring wall of sound at times. Luckily, the songs are built so there is plenty of time for guitar and violin solos as well as calmer sections, and that helps to keep the set dynamic. The classic “And Plague Flowers the Kaleidoscope" ends their time on the stage with its beautiful violin intro that immediately gets a couple of recognizing cheers and as they wave and exit the stage in the end, it seems their most die-hard fans are completely ready for them to keep on playing or return as soon as possible again. Despite my issues with the sound and the onset of numbness towards parts of their music due to the constant onslaught, it is a worthy set of great musical skill for sure. 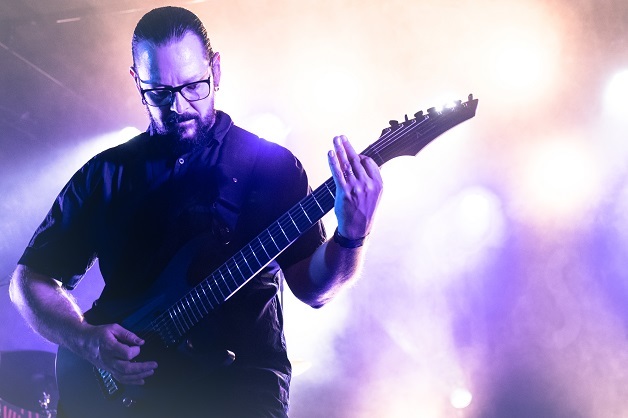 Ihsahn, with the more regular name Vegard Sverre Tveitan, has been devoting himself to his experimental and progressive solo project for years now, since his black metal band Emperor split up and stopped releasing albums in 2001. 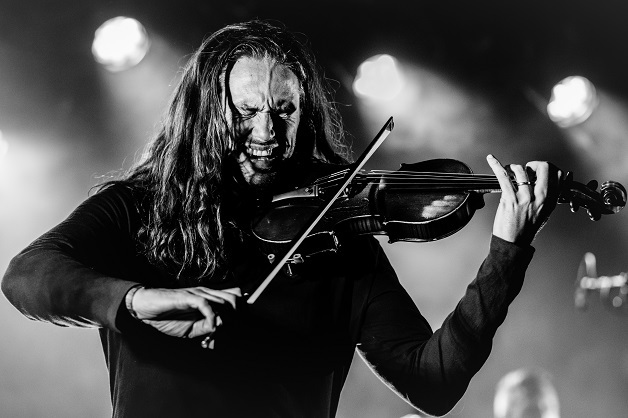 Still, it is his first time here in Denmark and with his seventh solo album “Àmr" released earlier this year, there is more than enough songs to choose from for the ultimate setlist. I myself mostly know “Àmr" and the magnificent previous record "Arktis" from 2016 and thus I am looking forward to hearing songs from those as well as hopefully getting a glimpse into his back catalogue. 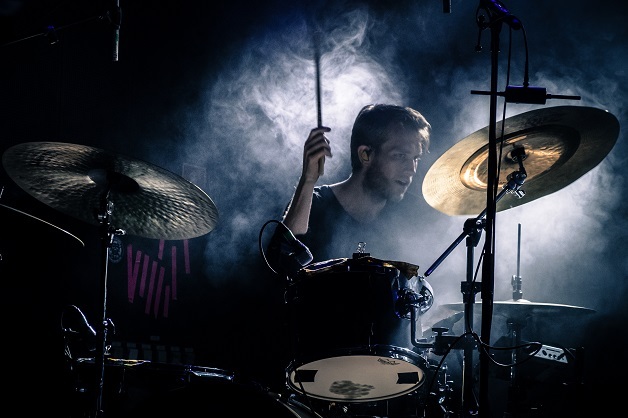 As he enters the stage with his band consisting of the current guitarist and the former drummer of fellow prog metal band Leprous, as well as a synth player, he seems energetic and happy to be here and they immediately delve into the opening trio of songs from the latest album. Especially the single “Arcana Imperii" gets the headbanging going in the room with its effective riffs, followed by the heavy synth-backing of “Sámr" that really sets an ominous atmosphere. As the set progresses, we move more and more towards intense black metal riffage but many of the first tracks and especially the more experimental “Hiber" provides a standout moment in showcasing the sheer width of Ihsahn’s musical work. Soundwise, there’s a good heaviness running throughout the show but Ihsahn’s singing and growling almost get overshadowed in the mix fairly often. There’s great variation in his voice, though, and whether soft and clear or more sinister and rough, his presence is undeniable. His guitar-skills shine as well, obviously, and especially so in the second half of the show. The 80’s-inspired "Until I Too Dissolve" really kickstarts the shift to a heavier part of the show with its addictive main riff that soon has the audience clapping and moving along although no actual moshpits or the like break out tonight. The intense blackness of "Mass Darkness" arrives soon after with a change for both guitarists to their 8-strings that makes it sound absolutely massive. Another "Arktis"-track comes soon after as "My Heart Is Of The North" prompts him to show off his specially decorated guitar with a map of Scandinavia on it even featuring a tiny Denmark at the bottom, of course gaining some excited cheers from around the venue. Finally, the hard-hitting duo of "The Paranoid" and "Celestial Violence", the latter especially beautiful here tonight, gets some solid sing-a-longs and allround horns in the air before one of my favorites from the new album, "Wake", ends the regular set in bombastic fashion. The applause has no end and the band soon return to the stage for a solid encore. Here Ihsahn harks back to his older albums with an aggressive track that continues the success from before in terms of getting the crowd to be more active. Finally, he leaves us with a slightly more calm song in "The Grave", featuring a backdrop of a cacophonic saxophone. 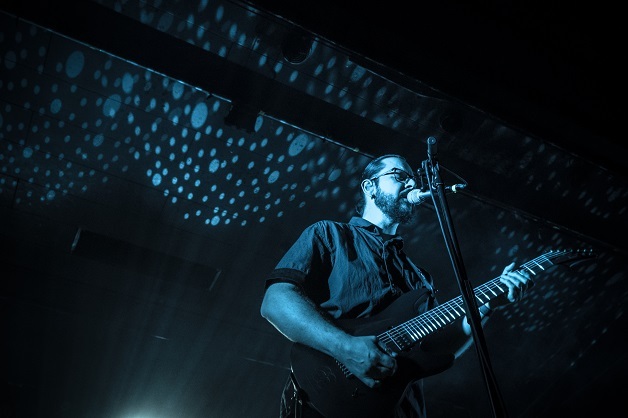 Despite the ease with which the musicians play all of these songs and despite the reverence Ihsahn must surely meet in the eyes of the excited audience, he comes off as an approachable and down-to-earth man who is nevertheless still acutely aware of his status. It makes him a great frontman who confidently leads us through the set with just the right injections of energy at just the right times but without any kind of arrogance. There are some magical moments in the show tonight but it doesn’t consistently stay there, in part due to the sound mixing of his vocals as mentioned. Another detracting factor is that the vibe in the room never really goes wild, perhaps because of the sheer lack of people. Still, it is definitely a night well spent in the company of some of the best prog musicians out there and I can only encourage even more metal fans to show up if we see Ihsahn again in these parts of Scandinavia.